When Chef Cedric Maupillier left the helm of the critically acclaimed Michel Richard restaurant Central, the food world went crazy. When he announced he was opening Mintwood Place, it exploded. The hype was intense, the lines were long, and everyone noticed. In fact, the restaurant is nominated for the James Beard Foundation Award for Best New Restaurant and Chef Cedric is a semi-finalist for their coveted Best Chef award, broken down by geographical regions. Thankfully, Mintwood and Executive Chef Cedric’s team did as well and they have responded with continuously exceptional service and both food quality and presntation. 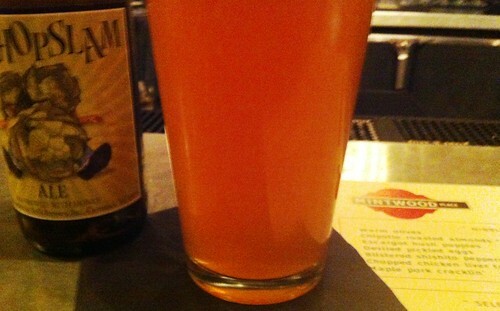 Poaching some amazing bar staff from the recently closed Againn (tear), and several other heavy hitters, Mintwood needs to be your new favorite restaurant. Located in Adams Morgan among some local favorites that can best be described as upscale dives – in the best and truest since possible – Mintwood provides an open dinning space inside with rustic and warm interior features. The semi-open kitchen and long bar with seating area provides a vibrant setting to grab a few beers and some food, should you choose not to dine on the other side of the partition where their actual dining area resides. Rich woods and the absence of floor-to-ceiling walls make Mintwood enjoyably bustling without feeling closed off. Start by heading to the bar and grabbing a beverage – they have an extensive and very heady beer list as well as some serious talent that can likely twist up any drink your heart desires. Once seated, the real feasting can begin. Oh, and there is a singular salt shaker on the table should you wish to alter your food. I appreciate the option. With several “nibbles” to choose from, don’t miss the deviled eggs, pickled deviled eggs to be exact. The egg is pickled in house, then the yolk removed, seasoned delicately and then piped back in. 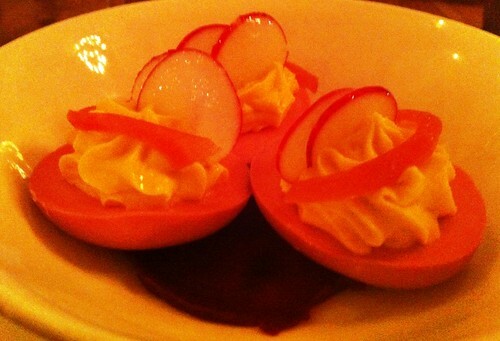 Garnished with a slice of pickled red onion and two crisp radish slices (which add a nice textural contrast), served on a bed of sliced beets, it really is a perfect deviled egg. 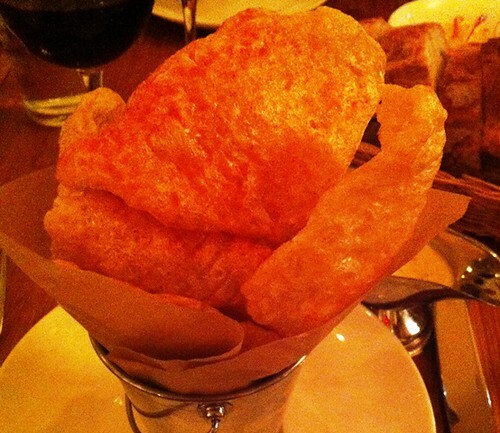 From there, the maple pork cracklin’ is a must order (especially for any good Southerner like yours truly). I make my own fresh pork cracklin’s, and I can honestly say these were very good. The pork fat layer is pressure cooked or simmered for hours typically to soften it prior to being flash fried into a light, salty, porky chip essentially. Dusted lightly with seasoning and paired with a creamy sauce for dipping, it’s like the popcorn of the Gods. Also good choices are the escargot hush puppies and chopped chicken liver tartine. 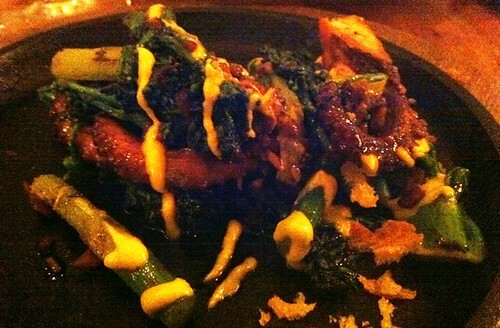 Moving on to the “starters,” there are a variety of salads, all of which are good, but I like the grilled baby octopus served with wilted greens and grilled asparagus, topped with a rouille sauce – a French style mayonnaise that typically consists of olive oil with breadcrumbs, garlic, saffron and chili peppers. 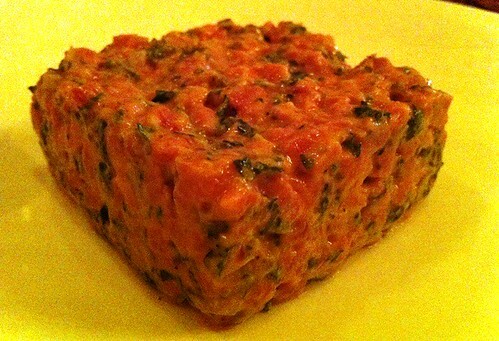 For the meat lovers, well, the raw beef lovers really, get the steak tartare. The very fresh, perfectly tender, melt in your mouth steak is mixed with the perfect amount of mustard and spices that all you really need is a spoon. Or the perfectly toasted crostini will work as well. For the main course, the cast-iron Amish chicken and the duck breast which comes sliced in a long plate over a bed of sauerkraut are likely two of their more popular items. If you like duck, get the duck. 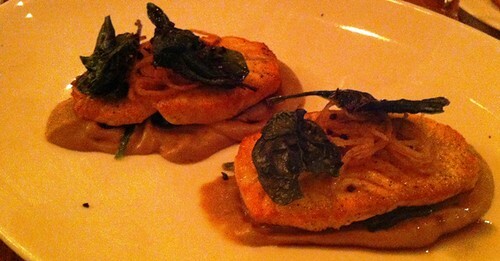 For lighter fare, try the Salmon, which is lightly smoked, and served with chestnuts, spinach, and cocoa nib. Delicious. Don’t forget to ask about the specials – right now it’s fresh Shad filet and roe (eggs). But don’t forget the sides. 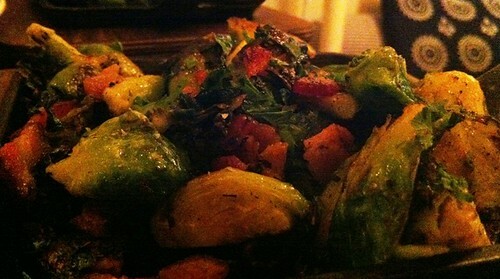 The Brussel sprouts with bacon are some of the best in DC. 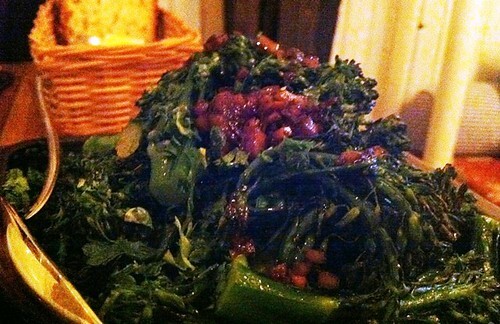 And the grilled brocollini with pomegranate seeds are also very good. And you can tell mom you had two green vegetables with dinner. It’s no wonder the James Beard Foundation gave nods to both the Chef and the restaurant; just make sure you go before it gets too popular! Where: MINTWOOD Place, 1813 Columbia Road NW, Washington, DC 20009. Online.